SOUTH is a dystopian fiction set in an alternate America, set in modern times, where a civil war breaks out between the North and the South. The story follows a variety of five characters, each trying to kill, hide or survive. The book follows Garrett and Dyce, on the run from the South’s law enforcement; the Callahans. Whilst journeying through the South, they meet Vida, a woman trying to find a cure for her mother’s illness. Felix Callahan is an old man living in an isolated bunker underground, having abandoned his fellow kin and awaits the coming apocalypse. Finally, there is Tye Callahan, a lone wolf and the villain of the book. The book starts with an interesting and original take on how the writer Frank Owen handles flashbacks. In the opening chapter, Felix listens to an old recording of himself which acts as his diary detailing how the civil war broke out. It’s a unique idea in setting up the lore of the book. 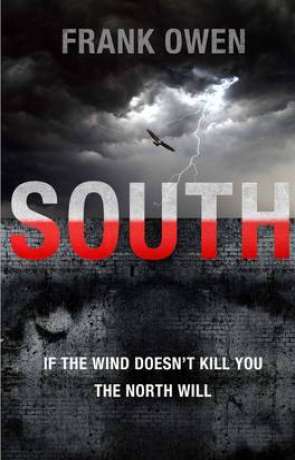 The story revolves around the two of the main characters, Garrett and Dyce, brothers that are trying to escape the clutches of the Callahan’s, and if they don’t kill them, the wind will; South takes a unique spin on the dystopian genre by including wind that carries fatal viruses. It’s an interesting mechanic the author decided to add that had me hooked, always excited to see what debilitating disease would hit the characters next. The writing helps reflect this feeling of how the characters are constantly being chased by something throughout the book, either the wind or the Callahan’s. The writing is fast paced and spends little time describing setting or location, as the characters are often gone by the next chapter. Until chapter 20, this works in the books favour. However, when the urgency of the Callahans or the wind is put to one side, the fast paced writing does more to hinder the story than help it. The description of the locations are often overlooked which makes it hard for the reader to envision where the characters are, you’ll see mention of a cliff or a field but the setting is scarce and bare. Even the settlements, the last outposts of civilisation, fall flat in making me empathise with its inhabitants. Another major issue I had with this book was how, because of the fast paced writing, the book struggles to have any tense moments. Whenever the characters are in moments of peril, where it looks like they might die, whether it’s being held by gun point or trapped in a cave, they always find some way out by the next page. I never got to fear for the character’s safety after I realised that and soon after, I lost interest in them all together. It becomes the books biggest shortcoming. After chapter 20, when less emphasis is placed on the Callahan’s chasing them, the characters just sort of drift from place to place with no tension or peril or goals driving the story forward; Dyce hears rumours of a town that is immune to all disease, The Mouth, this pride of the South, and the group find it within the day. If I could give any feed back to the author, I would tell him to work on this aspect of the story for next time. It would appear that the main focus of South is not on the story however, but on the characters and the trials they endure. Most of the book is spent flicking from one character’s perspective to the others, although some such as Tye and Felix receive less time in the spotlight than others which I felt was a shame given that they were two of the most interesting characters. Another character I really liked was Vida, a strong female lead who manipulates Garrett and Dyce to get what she wants. Out of the three main characters, she felt like the one I could root for and want to see win. South had this effect on me which was almost gladiatorial; I’d cheer for some characters to win, whilst others I’d wish a horrible, bloody death upon (which is usually what I got). We spend most of the book looking through Vida’s perspective, more so than any other character. However, whilst she along with Felix and Tye felt well-written a lot of side characters feel ignored as they are seen once or twice throughout the book and their roles are mostly minimal. Even Dyce and Garrett, two main characters, felt like they could have been handled better at times. Ultimately, South is unique. It has some aspects about it that makes it stand out; the concepts, the backstory, some of the characters, and the first third of the book draws you in with an intense feeling of being chased. However this fear is lost in the second act when the story loses all suspense. The characters and their narrations were the only thing driving the story forward and it became a real struggle to want to carry on. Chapters felt padded out with information about different character’s which developed them further, but didn’t contribute anything to the story. This lack of tension and drive in the second act left the finale severally underwhelming. If Frank Owen improves on these in the second book, I would recommend getting the series after it has come out; hold off on getting SOUTH for now. Wait and see. Written on 18th August 2016 by Sam.